Cape To Cairo has only been a member of the Ellerton Zahra Racing team for a short time but the mare is already a winner for the stable after her determined success at Echuca. Owners Wyadup Valley Farm sent the mare to trainers Mathew Ellerton and Simon Zahra for her latest campaign, which began with a fair effort over the unsuitable 1300m on the Geelong Synthetic track on June 15. However, the addition of blinkers made a huge difference to the Invincible Spirit mare’s performances. 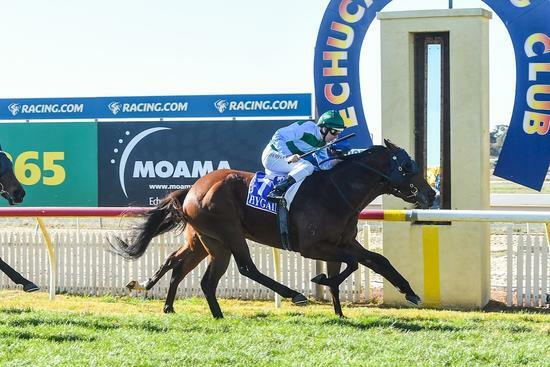 Cape To Cairo finished a narrow second at Bendigo at her first outing with blinkers on July 6 before going one better with her fighting effort in the EMPD Maiden Plate (1600m) at Echuca. Damian Lane continued a long-standing relationship with Wyadup Valley Farm owner Trevor Delroy when he made the trip to ride Cape To Cairo in the $25,000 race and the top jockey gave his mount a sweet trip in the early and middle stages. Lane sent Cape To Cairo three-wide to get into the race approaching the home turn before the four-year-old showed her staying potential when she ground home over the top of the leaders to score by a head. “It was a much-improved run with the blinkers on last start and I thought she was really well place today,” Lane said. “(Stepping) up to the mile suited and she got the job done. Cape To Cairo’s maiden victory came at her 10th start and was an important win for the stable as the first in partnership with Delroy and the team at Wyadup Valley Farm. Congratulations to Cape To Cairo’s owners and all involved with her Echuca success.